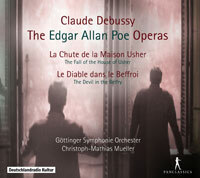 CLAUDE DEBUSSY (1862-1918): La Chute de la Maison Usher, Le Diable dans le Beffroi (both reconstr. Robert Orledge [b.1948]). Description: Debussy devoted himself intensely to two operas based on texts by Edgar Allen Poe during the last few years of his life which were dominated by ill health. He continued working on Usher (begun in 1908) until shortly before his death and was distraught at not being able to complete this composition. The version here is the one premiered at the 2006 Bregenz Festival and released by Capriccio on DVD (no longer available). “The Devil in the Belfry” (begun in 1902) has only survived in sketch form. The English musicologist Robert Orledge, a renowned expert within the field of French music at the beginning of the 20th century, reconstructed both operas with great sensitivity to Debussy’s compositional style, augmenting missing passages. Almost nothing exists of the latter and how Orledge produced a 37-minute performing version is not detailed in the notes. 2 CDs. French-English libretti. Williame Dazeley, Eugene Villanueva (baritones), Virgil Hartinger (tenor), Michael Dries (bass), Lin Lin Fan (soprano), Göttingen Symphony Orchestra; Christoph-Mathias Mueller.